There are lots of free and $1 movies around Jacksonville. Whether you want to go to a movie during the day or take in an evening show, there’s something kids of all ages will enjoy. Who doesn’t love free summer movies?!? Regal Summer Movie Express – Starting on June 6th, Regal Theaters will offer kid movies for just $1 at 10am on Tuesdays and Wednesdays. Cost: $1 per person. Summer Kid Movies at Sun-Ray Cinema – Special kid movies will be offered for $2 on Wednesdays and Saturdays this summer. 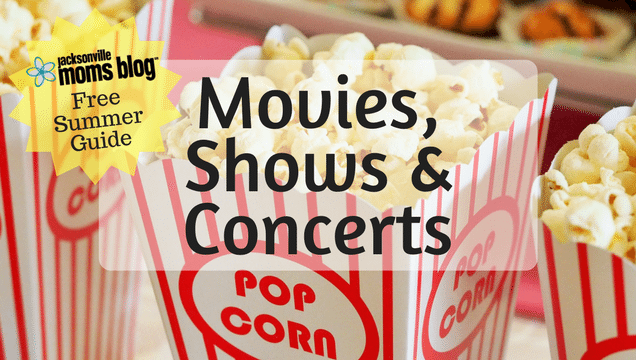 Summer Programs at the Library – The Jacksonville Library offers shows, movies and programs all summer long at various locations. JMB's Ultimate Guide to FREE Summer Fun! Click Here for More FREE Summer Fun!